I keep waiting for the vegan-parenting thing to get hard. So far Halloween has worked out several years in a row. Ditto with the neighborhood Easter egg hunt (where we hunt for plastic eggs with fruit-sweetened, gelatin-free jelly beans, and give any chocolate we find to other kids). We’ve gone to a few birthday parties where I bring along some vegan cupcakes, that make my kiddo and a few other ones very happy. Our preschool doesn’t let kids share lunches, and when LP has asked to share goldfish crackers for something similar at playdates and such, he gets over it quickly when we say the snack has cow’s milk in it. I keep expecting raising vegan kids to get more difficult. I gear myself up for every new social interaction or educational situation. But so far it’s been easy. At home my kids much on tofu, peanuts, and soy yogurt. Out in the non-vegan world they seem to be floating along just fine, barely aware that they eat differently from anyone else. People aren’t defensive when we say we’re vegan. In fact, people are downright kind and thoughtful. 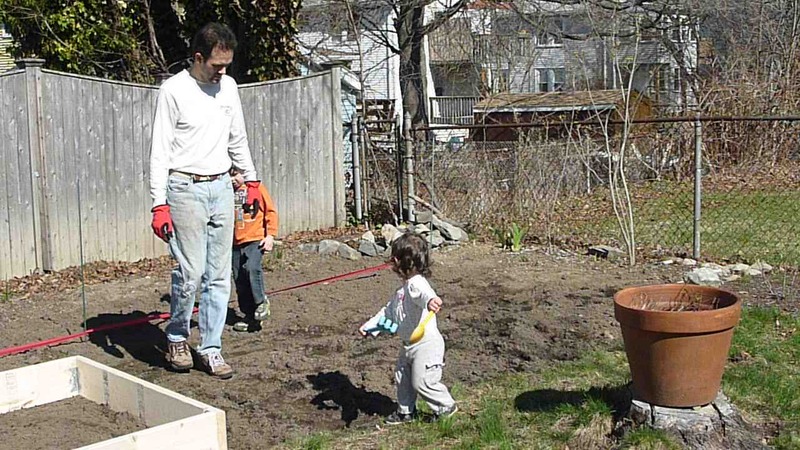 Planting our garden – we’re growing lots of veggies this summer! It’s nice to be pleasantly surprised by all of this. I still worry a little about kindergarten, and so on. But I’m hoping my fears are as unfounded as that point as they have been so far. Being vegan is easy for me because it makes sense to me. At this point in my journey, the idea of eating animals and their secretions is far more strange and unnerving than the idea of eating vegetables, fruits and grains. I’m starting to think that my kids are going to start their young lives feeling similarly, and that they won’t be social pariahs because of it. While I’m always ready for a good fight to defend the lifestyle my husband and I have chosen for our family, it’s really nice that there haven’t been any real battles yet. 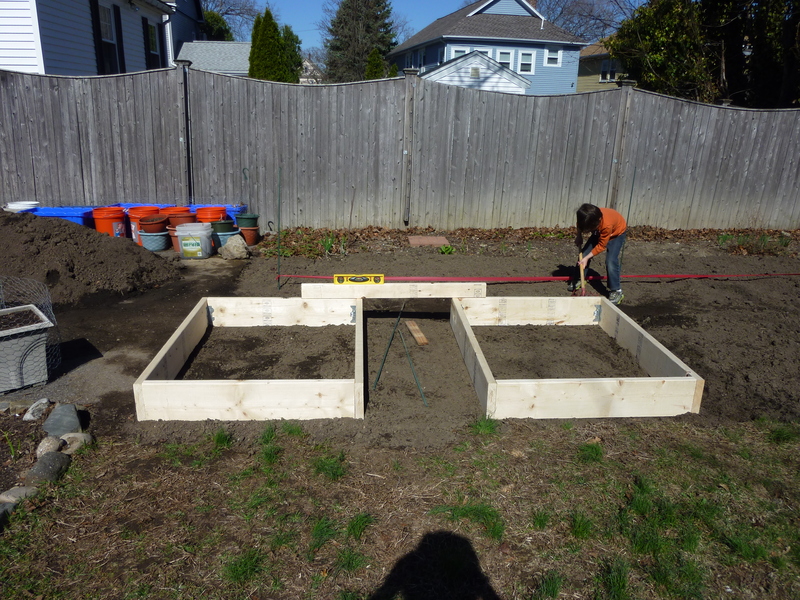 LP setting up raised beds!